Wheat wines are not a very common beer style, so I was pleased to see this offering from Boulevard at the local store. This beer is part of the Boulevard Smokestack series, an eclectic mix of high gravity beers ranging from American to Belgian styles with lot of twists and a healthy amount of experimentation. I recommend trying any you manage to get your hands on, and will review several in the coming weeks. Like a barleywine, wheatwines are strong ales with a wheat component, as the name suggests. 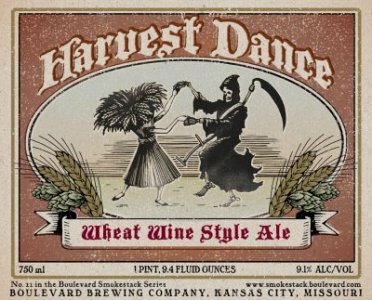 This beer has a great label with a bunch of wheat dancing with death, which is how nights of drinking high gravity beer should finish. The brew was aged in oak, and like most (all?) of the Smokestack series, bottle conditioned. APPEARANCE: Golden color with a hint of cloudiness. HEAD: Oh my! Like a foam snake. A solid head of fine bubbles rose to the top of the glass, and then dissipated rather quickly. I should have used this to toast the new year. LACING: Little bits left here and there. When tipped to the side the glass holds a thin, uniform layer. NOSE: Pleasant with some floral notes, pear, and a hint of yeast. TASTE: Starts things off with some honey and caramel, which is balanced by strong citrus from the hops. The finish is peppery, very dry and bitter, with a typical wheat notes and grapefruit rind. This is not a sweet offering like a barleywine, and it lacks the sweet heavy toffee flavors of that style. In some ways this is more similar to a farmhouse ale. DRINKABILITY: Very smooth, medium carbonation, the smoothness and delicate carbonation combine for an excellent mouthfeel. Move over Miller Highlife, this is really the champagne of beers. The body is fairly light for a beer this big. The alcohol is definitely there in the finish and the aftertaste. Nice and warming, which is good considering the low is 9 degrees tonight. Like grapefruit rind, this beer makes your mouth water after consuming. For some non-aleheads who like light wheat beers, this could be a gateway to more interesting brews. Not my favorite of the smokestack series, but unique and well worth a try. Posted in Tasting Notes.Tagged Boulevard, death, harvest dance, wheat beer, wheat wine, Wheatwine. I’ve been very impressed with the Smokestack Series…particularly since they started bottling in 12-ounce containers which means I can purchase them in ‘Bama. The Long Strange Tripel and The Sixth Glass are both very interesting and worthwhile examples of their respective styles (Tripel and Quad)…and the Double-Wide IPA is a solid Imperial IPA. But for my money, the Dark Truth Stout (a Belgian Imperial) and the Tank 7, a Farmhouse Ale are the two “must-trys”. Both highly complex, but highly drinkable brews that showcase what the folks at Boulevard are capable of. At first glance, Missouri may appear to simply be the land of Anheuser-Busch, but Boulevard is proving otherwise. When I moved out here I loved Boulevard immediately, for the simple reason that almost every bar or restaurant has one or two Boulevard taps, saving me from drinking bud/miller/coors. Also, I know a lot of folks that generally only drink light lagers and American Pilsners, but will drink Boulevard Wheat and Pale Ale because it’s local, which is really cool. Enter the smokestack series, now I love Boulevard because they produced world class beer. I was completely blown away by the sixth glass. I want to do a side by side tasking of it and the Bourbon Barrel Quad soon (which is a numbered, limited release, though it seems like my local suds shop got about half of them this year). Tank 7 has become a local favorite on tap out in these parts, and is especially nice on a 100 degree summer day. Another one I can’t wait to try is the Cedar-aged Doppelbock.